Each and every Mercury retrograde has its own personality or flavor in that it highlights the astrological picture of the moment and asks us to pay attention in a particular way. This one is most definitely about the Jupiter, Neptune square, with a dash of Saturn, Pluto and Mars. Mercury will square Jupiter, sextile Saturn, Pluto as well as Mars and, as if with a flourish, it will make the station, direct conjunct Neptune. At the very least it is a period of connection and integration. The square to Jupiter seems to point to the ongoing confusions we are experiencing collectively as well as individually. The issue of true and false is aggravated by the retrograde issues of miscommunication and distraction. The sextiles to Mars, Pluto and Saturn suggest there is lots of opportunity to overcome the sense of confusion if we embody our experience rather than, let us say, research it. If you feel swept away in confusion which may simply be too much information, go for a walk and while you are walking tune in to your arms and legs, your eyes and ears. Earth (Saturn and Pluto in Capricorn, Mars in Taurus) loves presence. The station direct on Neptune underscores all things Pisces: The soul of our planet, our species, is a real thing. To deny this is to risk something profound, to be swept into the sea of algorithmic manipulation with no boat. Compassion is Pisces’ greatest gift, addiction might be its worst. We might reach toward compassion by starting with ourselves and let this be as a stone in the water, creating ripples, touching all who touch us. 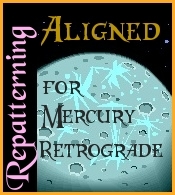 The most important day of any Mercury retrograde period is the conjunction with the Sun which happens on March 14th. This is the day when we can ‘hear’ the message on the wind of thought that may indicate exactly what we need to know to navigate the retrograde. This is quite close to the first quarter moon and the square to Jupiter suggesting that we need to be fearless in asking the questions. Answers won’t necessarily be what you wanted to hear. You can read more about Mercury’s aspects at Insights for the Month.